Report from Werner who led the ride. Rain overnight and enough wind to bring down one small tree/bush in Russia Dock Woodland between yesterday's route check and today's ride. Dry at the start and even a glimpse of sunshine. A hint of drizzle in the last quarter but not serious. The cold wind was still present and there were one or two envious looks at my neoprene overshoes accompanied by questions whether my feet were warm. An unexpected total of 10 riders including a first-time (AFAIK) delegation from LCC HQ, Charlie with a friend and Rose joined us. David reliably tail-ending as usual. Had gone down to Deptford yesterday, no sign of a functional bridge, so plan A, i.e. peninsular meandering. Decided it might be fun to stay within the wards of Rotherhithe and Surrey Docks (I think we briefly strayed into SE1 so I it wasn't SE16 only). An explanatory stop chez Salters (the new replacement statues of Dr Salter, wife and daughter) was necessary, as a few hadn't heard of them. Also lots of ignorance about Stave Hill so first-time ascensions while I guarded the bikes and professionally taken photos afterwards. About 1m into Deptford to go around the Boundary Stone and then a brief stop at Barry's bike. It was nice to see that somebody had put a bit of tinsel through the front-wheel, I think Barry would have approved it. Some of our riders weren't aware who Barry was so David, Charlie and I provided a bit of history. Bridge over Hertford Union Canal. Not the new bridge that is reached via this one, but for which we have no image. 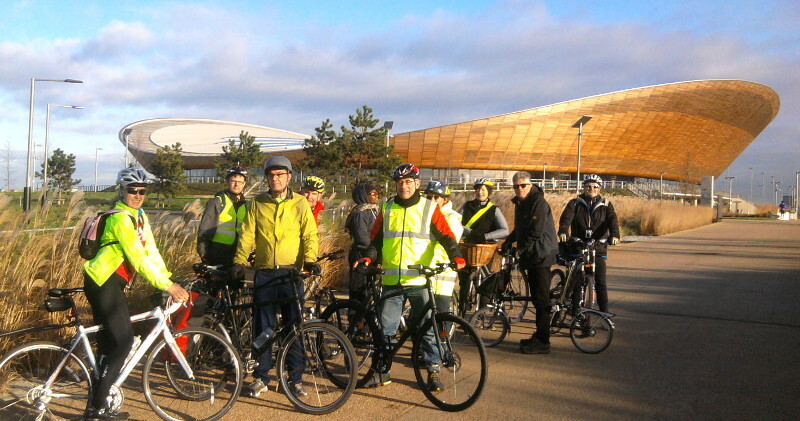 9 riders plus Bruce leading gathered for 9.30 at Canada Water on another sunny December morning. Boarded Overground to Haggerston where another rider joined us. Then along the Regents Canal Towpath, into Victoria Park, then to the Hertford Union Canal. Nigel then directed us to a brand new bridge that has appeared, unannounced, over the Lee Navigation. 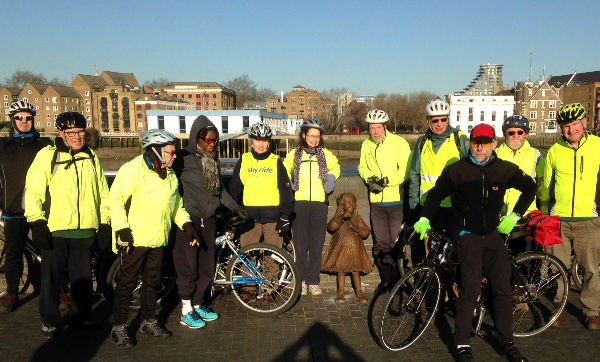 On a recent ride with another group, they had used the new “Tower Hamlets Bridge” over the Lee to the Olympic Park. We first crossed the existing bridge over the Hertford Canal (the one with the red “O”), to Roach St. 200m along Roach street is a new landscaped space on the left that leads to the footbridge over the Navigation and into the Olympic Park. Thence across the park to the velodrome. Had a 30 min stop there to get coffees and watch the cyclists training on the track. Riders at Salter Family statues on Bermondsey Wall East. Statue of Joyce, the Salter's daughter, in the centre. 12 riders at Canada Water on a beautiful, sunny morning. David started us at 10.05 and we headed down to the river and along to Deptford Creek. The new bridge was not open - a disappointment. But the word is that it will open before Christmas. Through the Greenwich Foot Tunnel and round the Isle of Dogs to Wapping, then on via the canals to St Katherines. Over Tower Bridge and back along the Bermondsey riverside. Photo stop at the replacement Salter family statues, the originals having been stolen in 2011. Back at Canada Water bang on 12 noon. Route here. An amazing 16 riders in Peckham Square on a rainy morning with a pretty iffy forecast. All well prepared for some rain, which in the end never materialised. Uphill start to Telegraph Hill using LCN 65 route that I had discovered from the recent Southwark Council Consultation on proposed “improvements”. Then run down to the Waterlink Way at Brookmill Park, along National Route 21, over Halfpenny Bridge (LCN 2) and NR4 to the Cutty Sark. Brief break there with photos (not received any yet, but they were taken!). Back through Deptford (Edward St, Childers St, Folkestone Gardens), and along Surrey Canal Rd (LCN 2). Next the lovely path across Bridgehouse Meadows followed by the dreadful non-crossing of Old Kent Rd to Brimmington Park. With 16 cyclists caused a mini traffic jam there – not good…. Finally wound our way through to Commercial Way and the Canal path and back to Peckham Square. For route see http://goo.gl/maps/GkEuB. Great turnout today for the plus ride with 21 of us led by Philippa starting out just after 9.30 from a drizzly Canada Water heading East on National Route 4. Luckily the drizzle soon stopped and cleared to see the sun do its best to come out and it stayed that way for the rest of the ride. We paused at City Hall for the requisite group photo before crossing to the northside of the river by Westminster Bridge. Then past the Houses of Parliament down Millbank turning off at Lambeth Bridge to rejoin NR4 (John Islip St and Lupus St) then across Chelsea Bridge to Battersea Park. The halfway point brought a welcome break at La Gondola cafe in the park by the lake for coffee and cake/Italian pastries. Return was via the south side of the river back to Waterloo - with another photo stop at the London Eye - then through the back of the station down The Cut and Union Street dropping down Redcross Way to pick up NR22 and back to Canada Water by Southwark Park for a 1 pm finish. Route at http://goo.gl/YLaq97. Panoramic photos by Peter Jordan. 10 am and 15 riders at Canada Water for the start on a wet and windy morning. Very good turnout for the time of year and conditions. Maybe not many other rides on offer? Several new riders from all over South London - even one from Biggin Hill.